What do you think of my new Good Fortune Urban Outfitters plant? I found it online and decided to have it up at my blog. If I had discovered it earlier; perhaps the unfortunate Dead Body Outside My Window and Fire incidents would have eluded my life last year! Time sure flies and I bet you didn't realize it's almost midyear. Over the last few months, I've been putting more effort into my blog; updating constantly and I hope to continue receiving more good luck and well wishes my way. Aside from the many awards bestowed upon me, several new job opportunities received via my blog and the wealth of new friends I've made since beginning of the year; there is always room for extra good fortune and happiness here. And what better way to usher more luck my way than by having this adorable good fortune plant here at Wishing on a Falling Star! 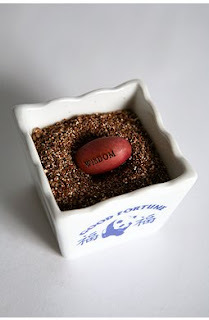 This ceramic planter comes in the usual take-out carton and is ready to start growing lucky messages for you. All you have to do is add in the soil and the magical bean seed. Make sure to water your new plant every few days. Then sit back and wait patiently for magic to happen! Watch your bud gradually sprout out from the bean to eventually split and reveal your very own personal fortune. 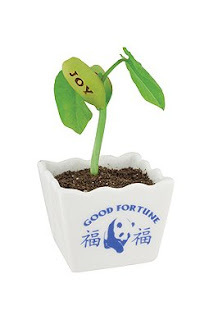 It looks and sounds too cute to pass so why not get a good fortune plant for your home or your office today? Happy shopping! Aiyooooo jahat la ur colleague said like dat Jean ha ha! Of coz la u were shocked sampai tears came out! Hugsy! Yeah, apparently she was a bit not right in the head and didn't take her medicine, so she took the plunge. What I heard. She was in her 40s. Ok, then I want to by 6 seeds Jean lol! Hahahahahhahaha, I was hoping ur good luck plant will rub off some of your luck on me ha haha!!! ROTFLMAO!!!!!!! jean, i also received that kinda email once and I was so freakin shocked!!!! �....hahahahaaha.....so funny la u Jean some more it happened in the office!! I oso LOL at Jean’s story he he! haha, always buy stuff & nvr use. that's why most products are targeting us as buyers, marzie! lol! didn't push myself far enough..
hahahaha, Ane! that time u get even wt B was enough scary. haha. it's funny how B denied being scared. :-D You've really got yr revenge, Ane! lol!